The tomb stands in the centre of a vast garden, which is enclosed by high walls on all sides. In the middle of each enclosing wall is a monumental gateway. The whole garden is divided into four equal quarters on the conventional charbagh plan. Each quarter is separated by a high terrace or raised path with a narrow shallow water channel running at the centre. Each terrace has in the centre, a tank with fountains. Only there is only one entrance in use today, there exist four red sandstone gates, which lead to the mausoleum complex. The decoration on the gateways is strikingly bold, with large mosaic patterns set into it. 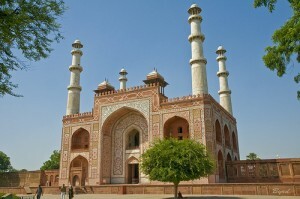 The gateway’s four minarets are inlaid with white marble polygonal patterns. A broad paved causeway leads to the tomb which has five storeys and is in the shape of a truncated pyramid, The main tomb has a unique square design which is unparalleled by all other Mughal buildings. The ground floor has spacious cloister son all four sides except in the middle of the southern side. The cloisters are divided into numerous bays by massive piers & arches. Each bay measures 22 feet square. The centre of the southern side is occupied by a vestibule which has been ornamented very profusely with exquisite carvings, artistic paintings and inlay work in geometric and floral designs, The second storey has an arcaded verandah on each side which is composed of 23 bays. The use of an ornamental arch and square pillar has brought about a unique composition. Third and fourth storeys are smaller in size than the one below it. They have an identical arrangement of arches supported on pillars and chhatris attached on the exterior to each facade. The fifth storey is entirely in white marble as against the lower storeys, which are finished, in red sandstone. This entry was posted in Sikandra, Uttar Pradesh and tagged Historical Place. Bookmark the permalink.